It has been such a pleasure to collaborate with Judy on this show! 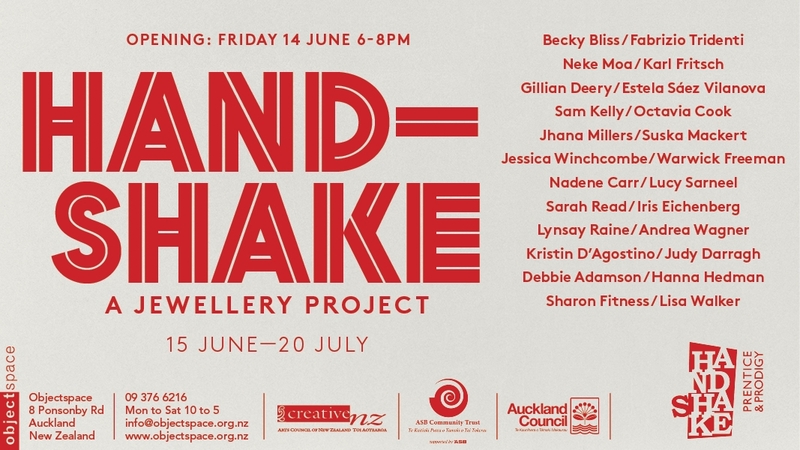 The Handshake exhibition is the culmination of the Handshake mentoring project that began in 2011 involving twelve, then emerging, New Zealand-based jewellers. 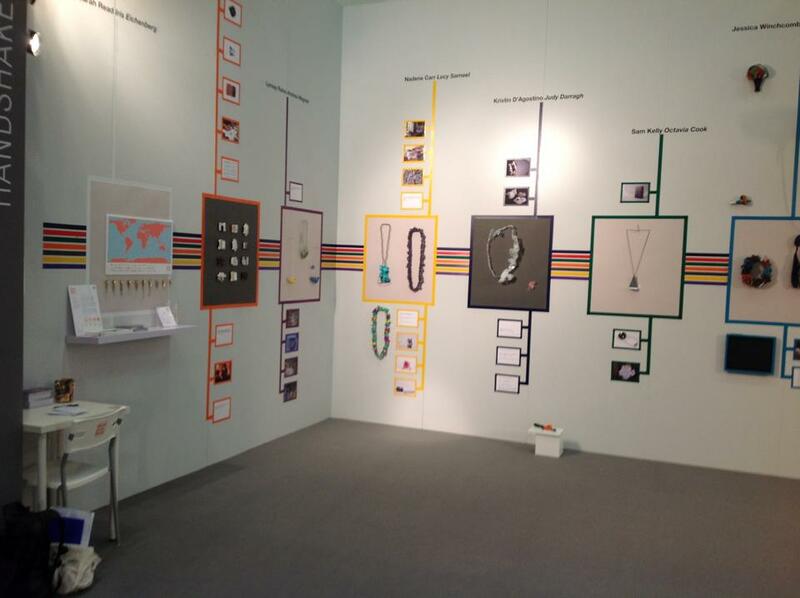 The project initiated by jeweller, teacher, and jewellery activist Peter Deckers, has provided the mentees with the opportunity to work with an internationally renowned artist or jeweller of their choice, as a mentor. The role of the mentor was to assist the mentee with establishing an ongoing practice that would extend beyond the duration of the project and provide professional support and advice during the process of them developing works for a series of Handshake exhibitions staged in Australia, New Zealand and Germany. While earlier exhibitions focussed on the mentees, the Handshake exhibition at Objectspace presents works by all the participants and highlights the collaborative process and unique qualities of the relationships between the pairs. The Handshake website (http://handshakejewellery.com) records the progress of the Handshake participants via blogs that chart the development and exchange of ideas which occurred through a mixture of email, Skype, and studio visits. A recently published bookHANDSHAKE – 12 contemporary jewellers meet their hero collects text and images from participants and features an essay from leading international jewellery commentator Benjamin Lignel. The book is available for purchase at Objectspace. In the final phase of this Handshake project each of the current mentees has been given the opportunity to select a new recent graduate, whom they will mentor for of a year,expanding on the ever increasing circle of learning and contributing to the dynamic flow of shared experiences. These graduating mentees- soon- to- be- mentors are the most valuable jewellery resources generated by Handshake. This entry was posted in Uncategorized on June 13, 2013 by kristindagostino. Second chance for a Schmuck – Take it away Poland….. If you missed Schmuck Munich, and you happen to be in lovely Legnica, Poland then you can catch my work in Schmuck 2013 from 30th April – 8th June. This entry was posted in Legnica, SCHMUCK 2013 on April 8, 2013 by kristindagostino. 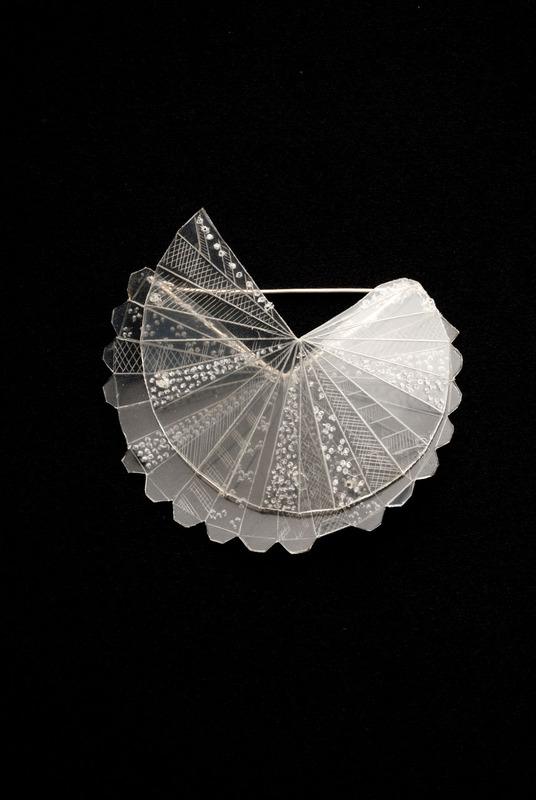 MakerWearerMatchmaker is a collaborative jewellery project losely based on my very own Broach of the Month Club that will take place in Sydney during ArtMonth, March 2013. This entry was posted in Uncategorized on March 22, 2013 by kristindagostino. It has been about 30 hours since my 30 hour trip home from Munich. I am happy to announce that I did not have a baby on the plane, even though the rumor of lifetime free flights was tempting. I am nearly back to normal, although I did question my ability to operate heavy machinery as I got behind the wheel of the car today….. There is so much to reflect on and share. I will try to post everything I saw over the next few weeks. So let’s start with the highlight and work our way from there….. 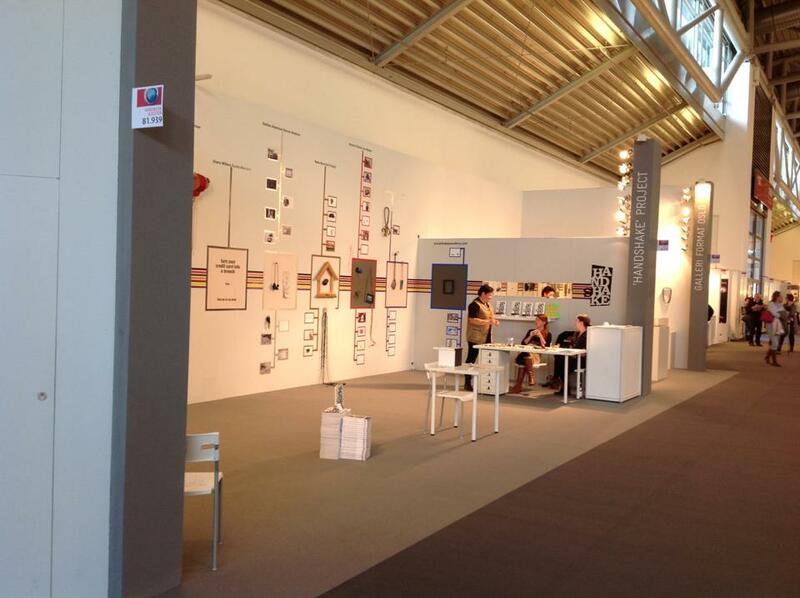 It was an amazing experience to see my my work at the show. 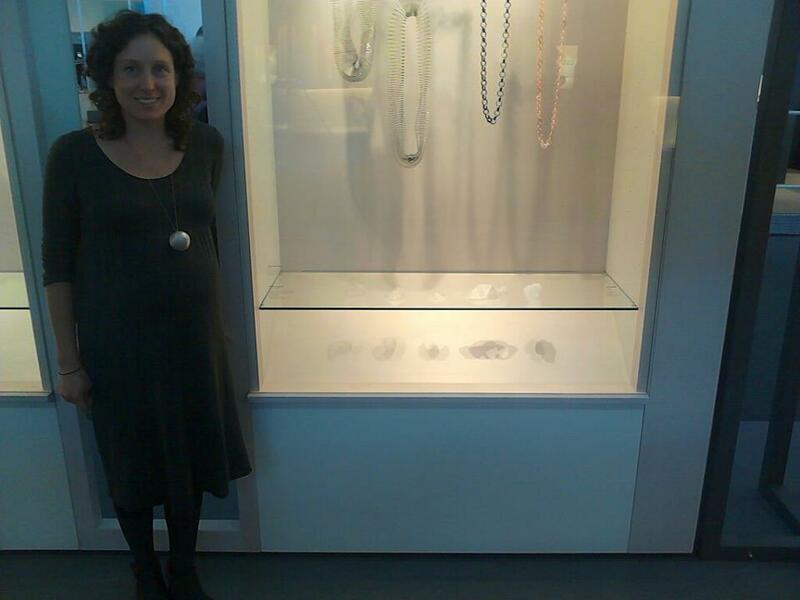 This is a mobile photo and doesn’t show the brooches that well, but it also glosses over how gigantic I am. And it does show the shadows off quite nicely. Thank you to Creative New Zealand who made this trip possible! Hurray. This entry was posted in Uncategorized on March 14, 2013 by kristindagostino. I have just returned from Schmuck-tastic-ness that was Munich 2013.I am still reeling from the event and in a happy jewellery daze.My camera has been momentarily kidnapped for the weekend, so snippets will have to suffice. 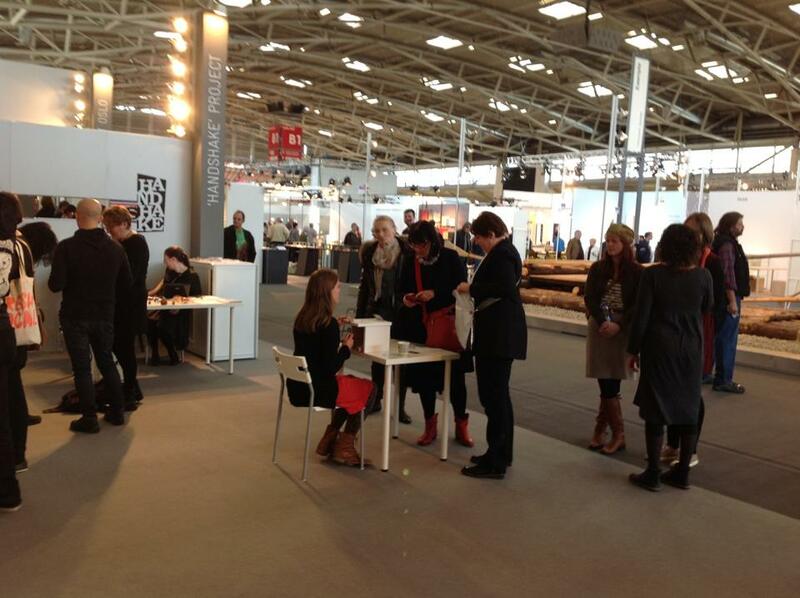 Here is the handshake install at the Messe Handwerk hall – in this image my work was on grey _ fifth from the left. I think that the aim of explaining the project, not just the work came through in this install. This entry was posted in Uncategorized and tagged schmuck 2013 on March 13, 2013 by kristindagostino. This entry was posted in Uncategorized on February 27, 2013 by kristindagostino.